We are located one block off the Town Square in the town of Jackson, Wyoming. 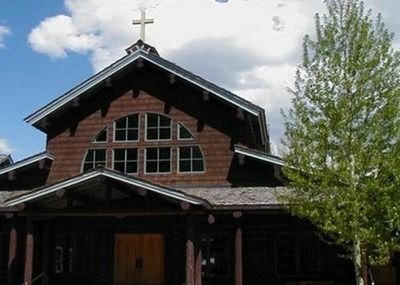 The beautiful log church, built in 1995, seats 250 people. Hansen Hall, youth rooms, and the nursery are also located in this building. Holy Communion: Sundays, 10:00 a.m.
After the Gospel, children ten and under are invited to follow the Cross to Children’s Chapel where they will learn an age appropriate Bible lesson through a fun activity and then rejoin their families for Communion. Nursery (Ages 0–4): Sundays, 9:45 a.m.–11:30 a.m.
Family Worship Service: 2nd Sunday of the Month, 10:00 a.m. Families actively participate at this traditional Sunday Communion with a children’s sermon. If prayer is a significant practice in your life, yet it sometimes gets crowded out very easily, you might enjoy the style of worship created by the community of Taizé in France. Taizé worship is based around structured rhythms of contemplation and silence that provide a way to “turn off the buzz” of our daily lives and experience a new depth of prayer. We would love to have you join us for this special service of prayer, song, and silence.